It was fun to compare Sceptre U550CV-U vs TCL 55C807. They are similar 55-inch Smart TVs with good reviews and affordable prices. 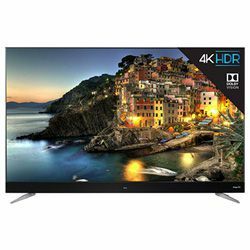 TCL 55C807 is worth around $750 versus Sceptre U550CV-U only about $300. TCL 55C807 is newer, it is released in 2017 while Sceptre U550CV-U has been released in 2016. The refresh rate is also the same, 60 Hz and the aspect ratio is 16:9 for both of them. Also, both have a viewing angle of 178 both horizontal and vertical. If you compare the two TVs you will see a smaller difference in picture quality though, TCL has a dynamic range HDR10 while Sceptre has none. Although it has a 3D, while TCL does not have it. Both TVs have a flat VA screen with a resolution 3840 x 2160 pixels. Plus both displays have 1.07 billion colors and a 55-inch diameter. The televisions have stereo speakers, Sceptre has 20W and TCL has 16W, a little bit weaker. No Dolby Surround or Dolby Atmos for the price point. Both TVs play similar audio formats, MP3, WMA, WAV, and FLAC. TCL also recognizes AAC and AC3. They both have Wi-Fi and neither has a Bluetooth. Also, they have the same streaming services: Netflix, Hulu, HBO, Amazon Video and Vudu. The TVs have remotes and a Smart TV feature. Neither of them works with Alexa but both have a mobile app. 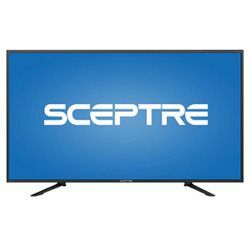 Sceptre U550CV-U has a display area of 91.16% while TCL 55C807 has 88.86% display area meaning that the frame of this TV appears bigger. Sceptre is black with a removable stand and 31 lbs weight. TCL is gray with a removable stand and 41 lbs weight. Both have a built-in VESA mount. A thin frame makes it very aesthetically pleasing. The picture is amazing, worth the price. TCL is heavier and consumes more power affecting your bills. The warranty is 6 months for both parts and labor. The warranty is 1 year for parts and labor. Some customers complain that it shuts down when the warranty expires. Dead pixels are pretty common according to the reviews.